VET Festival is a ground breaking event for the veterinary world to come together to hear, learn and network with the very best practitioners, visionaires and thought leaders in the world to discuss small animal veterinary medicine. Taking place on 7-8th June 2019 the forward thinking conference programme will be delivered by world-class speakers in the stunning grounds of Loseley Park in Surrey. 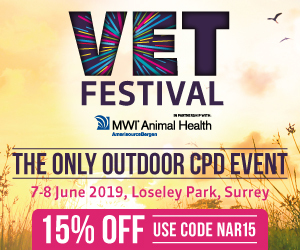 VET Festival is an opportunity to gain baseic and advanced CPD accreditation - learning from leading global experts on a variety of lecture topics. Delegates will be able to network in a relaxed environment. Book now using code NAR15 for a 15% discount or visit www.vetfestival.co.uk for more information about the event. First Aid for Hydrotherapists and Canine Professionals. Course price is £75 and there is an early bird discount of 10% for bookings taken and paid for by the end of March. For more information see the attached link or contact Blue Bear on 01206 213999 or by email at info@bluebearanimalrehabilitation.co.uk. During the workshop, we will help you to understand the stages of the grieving process that we all go through, to a greater or lesser degree. We will explore what is meany by complicated grief and different types of grief. We will aslo share a range of ways of helping and supporting ourselves and our clients through these losses. For more information click this link. REGULAR CANINE FIRST AID REFRESHER COURSES AT LOCATIONS THROUGHOUT THE NORTH OF ENGLAND - Delivered by Rachel Bean RVN, MCFBA . For details of where the next course will be held visit www.rachelbean.co.uk and contact Rachel on rachelbean@hotmail.co.uk. Courses last about 4 hours and a Certificate of attendance is provided. Following changes to the NARCH regulations Greyfriars are now pleased to offer a NARCH approved online First Aid Refresher course. If your previous First Aid Refresher was an attendance course you would be eligible to take this course. This allows you to complete your First Aid Refresher in your own time without the need to travel or login at a specific time and it only costs £50! include Hydrotherapy and NARCH-specific first aid topics. First Aid Courses by Katie Wilkinson RVN MBVNA who is based in the West Country. Her courses are directed at the Canine Professional and are a full day in duration. Katie will cover core first aid topics, in addition to Electrocution, Fitting, CPR and Drowning and you will receive a Certificate of Attendance detailing your name, the date, location, number of hours for CPD and signed by Katie Wilkinson RVN MBVNA, as Course Tutor. Please advise Katie when you make contact with her that you are a NARCH Registered Canine Hydrotherapist, so that she may ensure you receive the correct course content. REGULAR CANINE FIRST AID REFRESHER COURSES AT VARIOUS LOCATIONS THROUGHOUT THE UK - contact Sophie Fux at Animal Aiders info@animalaiders.co.uk for a course located near you. Courses cost about £40 and are taught by experienced RVNs or Vets lasting approx. 3 hours. You will receive a certificate of attendance and useful booklet. NOTE : Before you attend a course please make sure you advise Animal Aiders on 01284 811192 that you will require the specially adapted attendance certificate designed specifically for NARCH RCH's. We offer 1-day comprehensive Canine First Aid courses that are led and taught by qualified and experienced veterinary surgeons and supported by registered veterinary nurses. Using both theoretical and practical components combined with both live dogs and simulators, you will learn in a relaxed, supportive and engaging environment with small group sizes and plenty of instructors to allow you to develop your skills and confidence dealing with emergencies. The course covers a comprehensive array of first aid topics including all necessary requirements for NARCH. Contact us for 2017 course dates which are planned for venues in Worcestershire, Shropshire, Staffordshire, Derbyshire and the West Midlands. For further details please visit us at www.diamondrcs.co.uk or on Facebook @DRSLtd. Alternatively please ring us on 01902 238228.